Since 2017, the Coalition has been working in the UK Houses of Parliament as Secretariat to the APPG on Land Value Capture. It published its first full year report, "Capturing Land Value for the Public Benefit", in Nov 2018. The Coalition for Economic Justice (CEJ) comprises political groups, pressure groups and charities who came together in 2008 in response to the economic crisis of that year and who have continued to work together for the establishment of justice in economic affairs. We propose the introduction of an annual Location Value Tax (LVT) (also known as a Land Value Tax) to reduce existing taxes on enterprise and labour in order to rebalance the economy and prevent future economic crises. Our Coalition was formed in December 2008. Shortly afterwards, in March 2009, we convened a seminar in the House of Commons to promote the policy of taking land values. In March 2016, exactly seven years on, a second seminar was again convened by our organisation in the House of Commons. The recent activities of the Coalition are summarised in the latest annual report. For a summary of how Land Value Taxation has featured in the 2017 General Election, please see the article here. The CEJ annual report for April 2017 to March 2018 is now available here. Every economic crisis in living memory has been preceded by an unsustainable and speculative rise in property values, commercial/industrial as well as residential. The link between property values and bank and building society lending is strong and causal. Excessive lending fuels property prices. The rise in property prices is in fact a rise in the land element of the price, since the cost of building materials, and builders' wages, has risen hardly at all. An annual tax on the rental value of land would exert a restraining influence on property values and give some control over this key determinant of economic stability. Such a tax would also cut the ground from under excessive and imprudent bank lending and remove much of the speculation in land. With LVT introduced to reduce taxes on enterprise and labour, an overall tax increase is not required. In the present market economy the justification for a rise in prices is that it brings forth increased supply. As the land supply is fixed there can be no such increase. As economists from Adam Smith onwards have recognised, land is a monopoly. Rising property prices therefore serve no useful economic purpose. As such, they are the natural and obvious target for taxation. The LVT thus collected on an annual basis would help to reduce those taxes, many of which are unpopular (e.g., council tax and stamp duty) as well as income tax, national insurance and business rates which directly discourage production. LVT is a progressive tax falling most heavily where the benefit to the community is greatest and most lightly where the benefit is least. As the tax is based on permitted land use - not on current use (or non-use) value - LVT will penalise those who hold land out of use. It will therefore encourage land use and stimulate economic activity. With LVT introduced, there will be little or no incentive to speculate in land and hence property. Much of the credit which currently supports land (property) values would no longer be needed and would be available to finance the production of goods and services. LVT is easy and cheap to collect and difficult, indeed virtually impossible, to avoid. In our view the economic case for the introduction of LVT is a very strong one. So, indeed, is the ethical case. Since the community has created the enhanced land value it is only right that the Government (through an annual LVT) collect it for uses, e.g., infrastructure and local services, that benefit the whole community. We recognise, however, that the political basis for taking this forward, while feasible, requires deeper consideration. Within our member organisations (most of which are listed in the left hand column of this web page) there is a wealth of knowledge and expertise on this matter. Introducing LVT is much more than changing tax it is about fundamentally re-orientating the economy to encourage productivity activity and discourage and minimise "rent seeking" where wealth is acquired meaning through having control without providing any service. 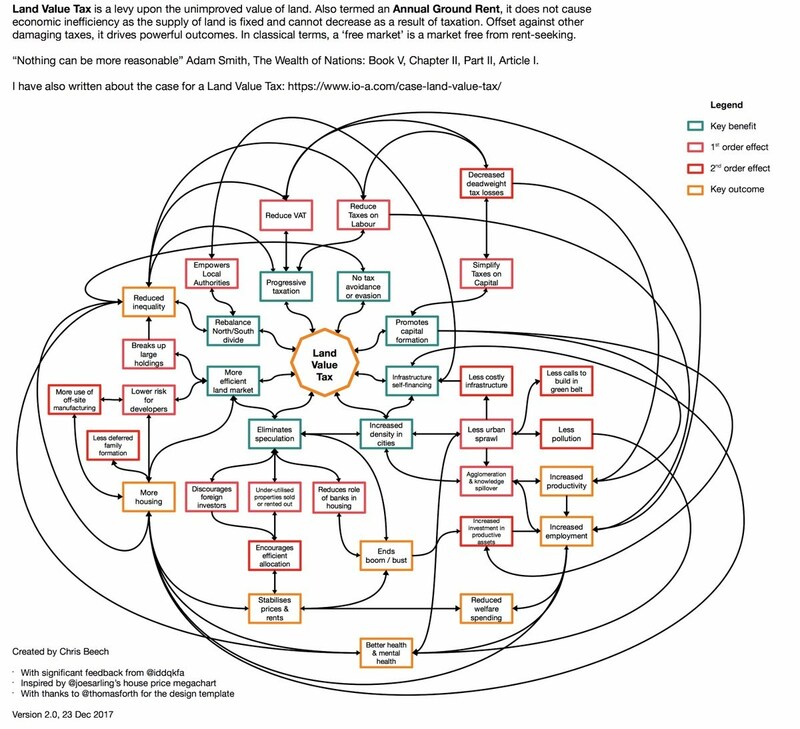 The diagram below by Chris Beech attempts to show the holistic effect of the change on the whole economy. In 2013 the CEJ commissioned a documentary to explain the relevance of LVT in the UK. 'The Taxing Question of Land' was screened at the RSA (Royal Society of Arts) HQ in London in winter 2013, and was very well received. The screening was attended by UK Government cabinet members. We are pleased to see the video has been viewed over 35,000 times. If you find this video informative, please circulate the link so others can see it too. If you would like to comment on what you've seen, please go to here. We strongly encourage sharing and lively debate at @TaxingQofLand. By means of moral and pragmatic reasoning, based on sound principle, the CEJ is working to develop an understanding of annual land value taxation - thereby obtaining recognition that the collection of the economic rent of land and natural resources is a key measure needed to tackle the current dysfunctional economic system. The CEJ is working through an Action Plan that supports the four aims listed above. There are numerous further articles and resources that are available from this website. Please browse the navigation panel on the left hand side of the screen for articles of interest. Should you wish to discover more about the work of the CEJ, or would like get involved, please contact one of the individuals whose details are listed in the column on the left of this web page.